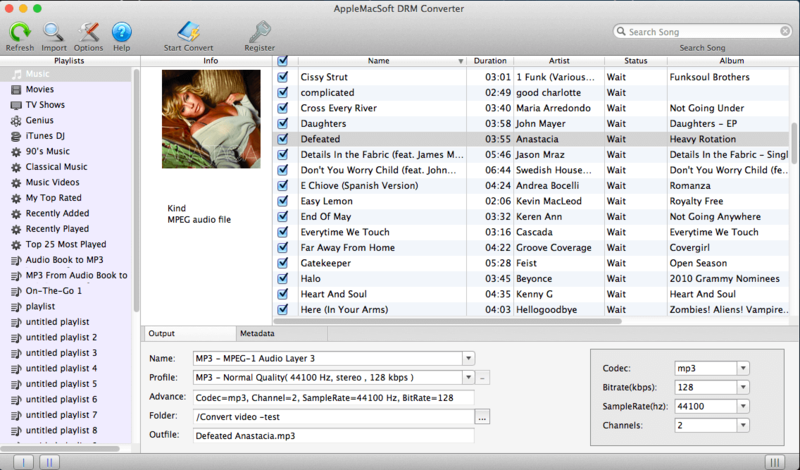 AppleMacSoft DRM Converter for Mac is an easy iTunes DRM removal software that designed for easily convert Apple Music, audiobooks, DRM protected audio, iTunes video and iTunes M4P to MP3 on Mac OS X. Batch convert DRM protected Apple Music or unprotected audio to MP3, M4A, AAC, AC3, MKA, Flac, AIFF, or AU files ready for use on any computer or mobile music devices such as Android Phone, Tablet, iPad, iPhone, PS4, Suface, Google Drive, MP3 player, Car player, smartphone - without any restriction or DRM protection. In addition to convert DRM protected audio, it also can convert any DRM protected audibooks (M4B, Audible AA/AAX audiobooks) to MP3 that could be played on your iTunes. Furthermore, you can also extract audio from iTunes movies, TV shows and Podcasts with no quality loss. Its ability to convert any DRM protected music and audiobooks into regular MP3 files makes it a perfect solution for people who purchase their apple music online but have compatibility issues with their music player. Batch iTunes conversion allows you to convert entire iTunes Library to MP3 with 100% original quality. The latest version of DRM Converter for Mac is fully compatible with iTunes 12.9 and macOS 10.13.6 High Sierra. Support 7 different languages: English, Spanish, Deutsch, French, Japanese, Simplified Chinese and Traditional Chinese. Compatible with iTunes 12.9.0.164; Fixed the failure to convert Apple Music to MP3 with iTunes 12.9; Remove empty playlist automatically; Fixed sample rate error; Other small bugs fixed.